In my blog post, Why Icicles Hanging from your Gutters is a Good Thing, Really, I said that if you have gutter guards installed on your home, icicles will hang from your gutters in the wintertime. 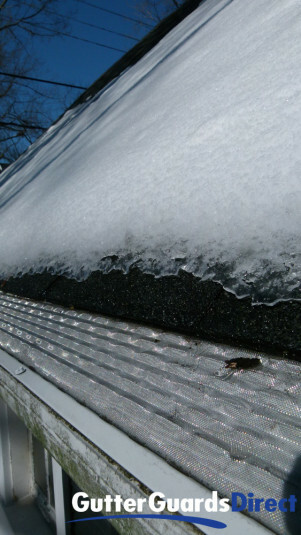 I also said that if you don’t have gutter guards on your house, your gutters will fill with ice and snow, and if enough of the white stuff accumulates inside your gutters, icicles will also form off the edge of your gutters. My belief is that it’s better to have gutter guards with icicles than open gutters with icicles because most snow and ice will be unable to enter into your gutters, heat from the sun will melt the snow and ice on top of the gutter guards and on the roof more quickly, and your gutters won’t be at risk of falling off your house like they would if they resemble ice cube trays. I have an area on my garage where I test gutter guards. Last year, I let the gutters fill with leaves and debris, then I installed a few sections of MicroScreen US micro mesh gutter guard so I could watch how this system performed during the fall and winter. This is a great spot for tests because the garage sits below several tall pine and Maple trees and I look down onto the garage from the inside of my house, so no matter the weather, I have an excellent vantage point. The garage roof is super steep — 12/12 pitch or 45 degree slope. MicroScreen US gutter guard slides under the first course of shingles, sitting at an 8/12 pitch, which translates to just under 34 degrees slope, significant for any gutter guard. The garage is not heated, so the inside of the garage is about the same temperature as outside, which means that snow and ice will stay on the roof surface until the sun melts it. Snow has been on the ground for the past 2 weeks, and it has been bitterly cold. The gutter is 5” wide and approximately 26’ long. It has downspouts on one end. MicroScreen US was installed in the middle of the run, so both ends of the gutter are open to the elements. That means any pine needles, leaves and debris that fall from trees or wash off the roof will land in the gutters. In other words, it’s a perfect mess! When I checked the gutters during a modest warm-up — I think it was 28 degrees — the sun was out, and the snow had melted off most of the gutter guards, but snow and ice was still inside the gutters, where it will stay until the temperatures climb sufficiently for a long enough period of time to thaw out the gutters. However, since then, we have received another 5 or 6 inches of fresh snow, so while there is new snow on top of the gutter guards, the amount of snow and ice inside the gutters now represents an accumulation of the last several snow events + the latest snowfall. 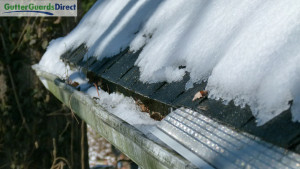 That means the exposed sections of gutter are being further weighed down while the section enclosed with gutter guards has prevented any new snow from entering the gutters. Like clockwork, as temperatures rise and the sun peeks out, the gutter guards’ surface will be free of snow and ice, ready to handle the next rain event, while the open gutters will still resemble ice cube trays, unable to handle the rains that are expected to hit before the next round of cold weather returns. Brrr…Now where did I leave my umbrella? Question: What techniques have you used to remove icicles and ice from your gutters?